A good friend of mine grew up seeing a revered old cowboy walk the small downtown area of Gainesville, Texas. When he asked about the identity of the man, he was told that he was a retired Texas Ranger who had captured some famous outlaws. My friend eventually learned that the old gentleman was former Texas Ranger Tom Hickman. Hickman was born in Cooke County near Gainesville in February 1886. His formal education was received from Gainesville Business College. He had a few jobs in the interim, including working in the rodeo and joined the Texas Rangers as a private in 1919. He was promoted through the ranks and became a captain in the 1920s. His areas included the Panhandle and North Texas during the oil boom. In addition, he worked bank robberies and other cases. One of the more notable cases was the Santa Claus Robbery in Cisco, Texas on Dec. 24, 1927. Marshall Ratliff, who dressed as Santa Claus, along with Robert Hill, Louis Davis and Henry Helms were unemployed residents of the area. They chose noon on Christmas Eve to hold up the First National Bank of Cisco. The bank was busy and had customers, including the mother of a six year old girl who had asked her mother to take her inside after spotting Ratliff enter in his Santa outfit. The bank employees were able to set off the alarm and a gun battle ensued, but the robbers managed to get away with $12,200 in cash, $150,000 in securities and other items. The quartet left the bank in a stolen 1926 Buick four door sedan only to run out of gas a few miles out of town, forcing them to abandon their loot and try to escape. The group was apprehended after an eight day manhunt led by Hickman. Davis died of wounds received in the battle with lawmen. Hill pled guilty and was sentenced to 99 years in the Texas State Penitentiary. Helms was also injured but stood trial and was convicted with Ratliff of bank robbery and murder for the death of Cisco Police Chief George Emory Bedford, who was killed as authorities and armed civilians exchanged gunfire with the suspects during the bank robbery. Helms was executed on Sept. 6, 1929. Ratliff’s attorney achieved his transferral to Eastland County pending a sanity hearing. Ratliff was moved to the County Jail on Oct. 24, 1929 where he escaped a few weeks later from an unlocked jail cell, retrieved a loaded .38 pistol from the sheriff’s desk and murdered jailer Thomas Jones. He was quickly recaptured and placed back in the jail. The following day, Nov. 19, 1929, Ratliff was removed from the jail and hanged on the Court House lawn by a mob. Hickman went on to have a long career with the Rangers and would continue with the agency until 1933 when he was fired by Governor Miriam A. “Ma” Ferguson. He was rehired in 1935 but left shortly thereafter in a dispute with Gov. James Allred, who had vowed in his campaign to create a new Texas law enforcement agency. Hickman’s leaving the Rangers for the final time is thought to have been over a number of items pertaining to the organzation and operation of the newly constituted force. In addition, some but not all sources refer to a disagreement over Hickman’s alleged failure to raid a suspected gambling establishment said to be owned by one of his long time friends. Regardless of the reasons, following his tenure with the Rangers, Hickman returned to North Texas. 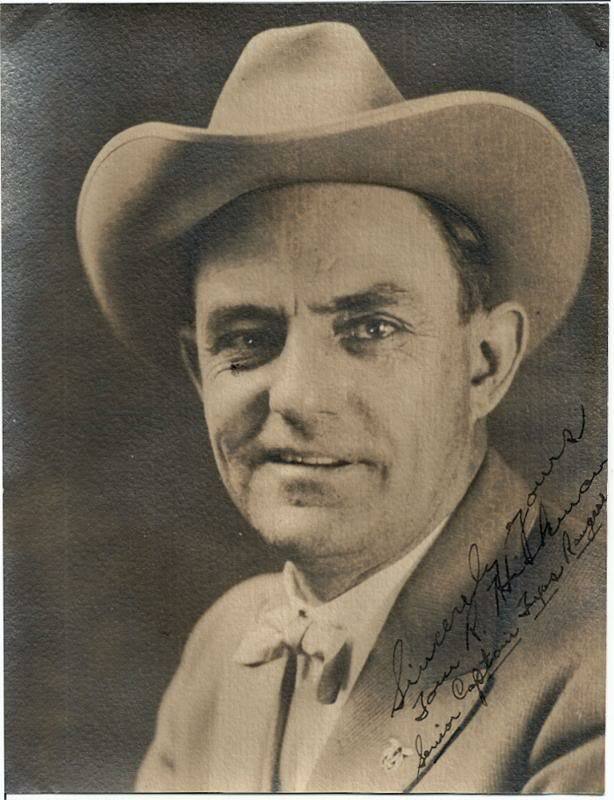 He had remained involved with rodeo as a past time and had judged the first American rodeo in England in 1924. For a few years, he served as a special officer for Gulf Oil Co until was appointed in 1957 to the Texas Public Safety Commission which oversees the Texas Department of Safety, serving as Chairman until his death. He lived on a 1,500 acre ranch in northern Cooke County where he raised cattle. He was active in Democratic politics, serving as Cooke County campaign manager for Gov. Allan Shivers. Hickman was often quoted in the press. After a visit to Britain’s Scotland Yard, he said, “I’ve seen a lot of police departments, but the Texas Department of Public Safety is the best of all.” Hickman is a member of the Texas Ranger Hall of Fame. He passed away in 1962 after an illness of a few months and is interred at Fairview Cemetery in Cooke County, Texas.